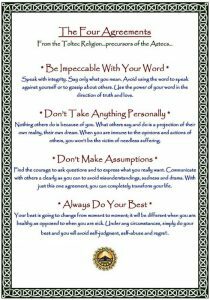 If you’ve taken any of my classes over the past three weeks, you know that I’ve been focusing my classes around the four agreements. 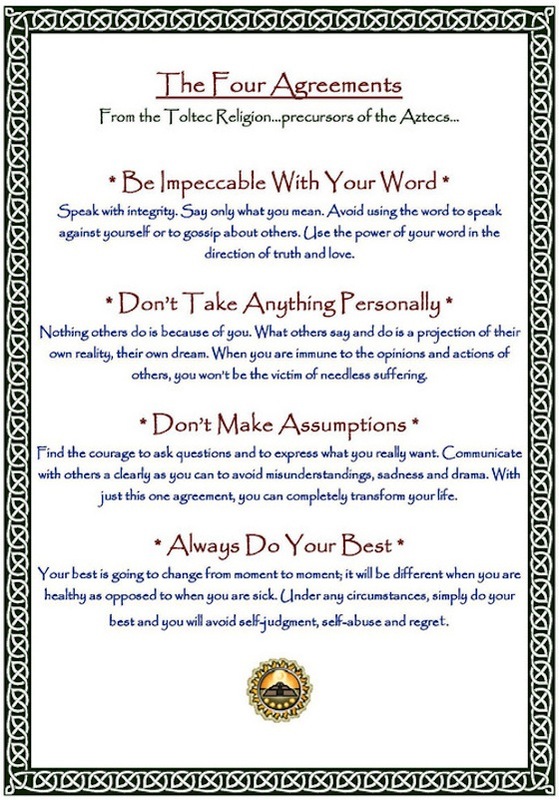 They were written by Miguel Ruiz and have become a powerful tool for transformation for millions of people. Although they are not associated directly with yogic philosophy, I still find the agreements invaluable. I inevitably find myself returning to one or three of them many times throughout my day to be sure that I am living in alignment with my core values. Any of this sound familiar? Has this type of inner dialogue ever helped you? Does it make you feel good? Is it necessary? The work begins inside. Practice being impeccable with your *thoughts* and likely impeccable words will follow. This is a habit we can only cultivate through practice.